Peter Capaldi’s first year on Doctor Who was layered with a lot of questions about the morality of the Doctor’s adventures. And one idea that came up was the notion that the Doctor had made the Daleks stronger in the course of fighting them. 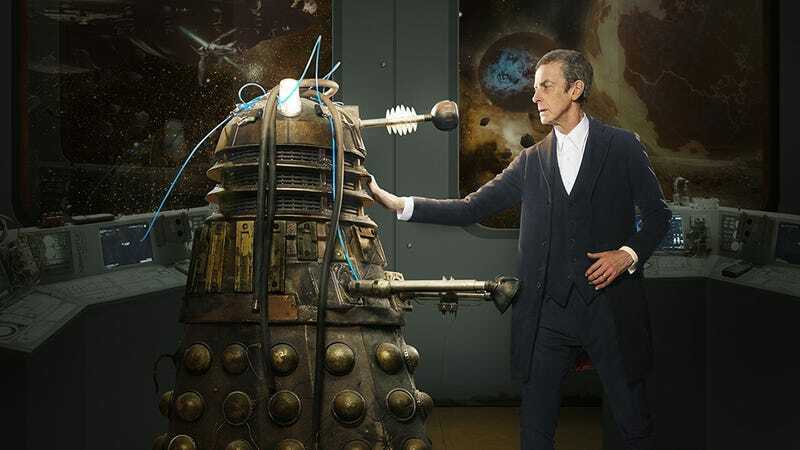 Capaldi tells io9 that the Doctor absolutely believes he made the Daleks worse. The Doctor spent a lot of last year questioning whether he was a good man, and wrestling with the morality of his actions, before deciding in the finale that he’s just an idiot with a box—how does that realization shape his character this year? “It does change his perspective for much of this season,” says Capaldi. “But it’s just like the way human beings develop and grow. That’s one of the things about [the Doctor] as a character. Obviously he changes with each regeneration, but within that regeneration, he changes as well.” So after regenerating, the Doctor had to struggle to find out who he was, and this was as much a mystery to him as to everyone else. Does the Doctor actually want to find Gallifrey? Once the Doctor does find Gallifrey, how will the show deal with the fact that Gallifrey is actually full of psycho Timothy Dalton and genocidal maniacs? We asked Moffat. To which Moffat replies that Gallifrey isn’t all bad. “If we’re going to be all judged by the standards of our governments, we’re all screwed, aren’t we?” There are plenty of nice people on Gallifrey. “What about the people who worked in the kitchens?” So if the Doctor does find Gallifrey, “some people are in for an arse-kicking. But he knows—he knows!—that it’s not people like us, the sad scum of the Earth, on Gallifrey, who are responsible for the terrible crimes of the High Council.” And just remember that the High Council was always sort of terrible, even on the classic series. Was John Hurt originally Christopher Eccleston? Meanwhile, we finally got our chance to ask Moffat something we’d wondered about for ages—was John Hurt basically playing the role that Christopher Eccleston would have had, if Eccleston had been willing to return for the show’s 50th anniversary? In the scene where Missy is sort of toying with Osgood before killing her, Gomez says she didn’t think of it as flirtatious—more like a big fat cat toying with a mouse before finally killing it. And Missy absolutely does know where Gallifrey is, says Gomez. And Gallifrey is a bit like Glasgow, she says. During Coleman’s first year, with Matt Smith, the focus was entirely on the mystery of her character, the “Impossible Girl,” and it was only once Capaldi took over that she got to have real character development. Was she happier once her character got to evolve and grow instead of being the subject of a mystery? Meanwhile, “it was really refreshing to be able to come back, the season after, and actually ground her more in her earth-bound life, and see what that is.” And getting to see Clara as a schoolteacher was really neat—she’ll still be a teacher this year, but we won’t see her kids going on adventures with her nearly as much, says Coleman.